A positive displacement blower with silencers creates the air required for material transport. A feeder assembly is an airlock and allows introduction of material into the high pressure system. The high pressure piping has a thicker wall thickness than low pressure piping. Flatback elbows are used when making a direction change as the high pressure system used fast velocities to transport material. A valve assembly allows the high pressure system to direct material to multiple locations. The valve is a machined piece of equipment and capable of handling the pressures typical of high pressure conveying systems. 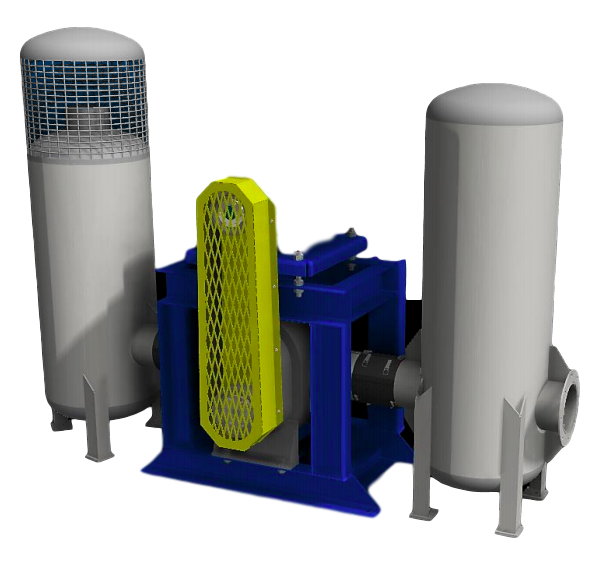 The high pressure system can end at a target box, primary cyclone or primary filter. An airlock is located below the cyclone or filter as to not pressurize the object below the airlock. All air is discharged to atmosphere with a cyclone or filter. 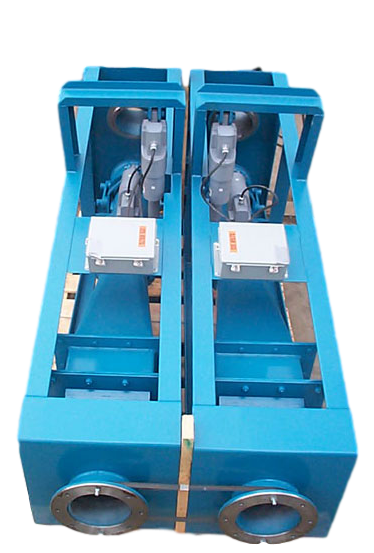 ​The feeder assembly consists of a rotary airlock, drive, tee-injector and support base. 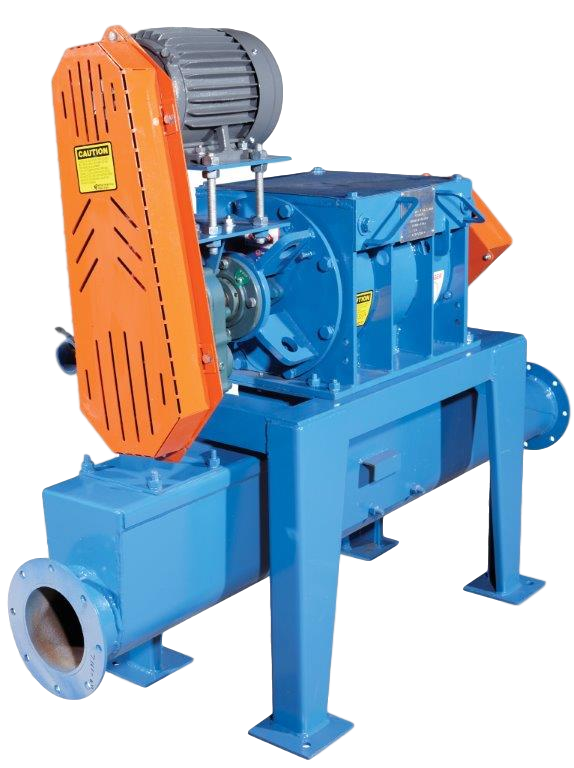 Metered material is directed into the top of the feeder, the feeder internal rotor assembly is turning and allows material to be deposited into the tee-injector below. 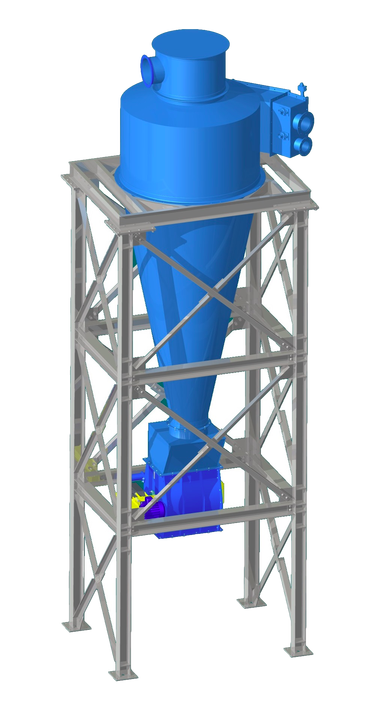 The feeder size is based on material volume passing through the feeder. The internal helical rotor is constructed of thick steel and the ends of the rotor include stainless steel machined tips. The feeder internal housing is machined and then chromed to extend the life of the feeder. A chipper quality knife is located at the top on one side and allows for shearing by the helical rotor blades.